Ten years ago, I officially ended my career path in television journalism when I started my own company with my wife, HRH Media. After ultimately resigning from two staff positions at NBC (as a producer) and CBC (as a reporter), I saw a 6-month contractual offer from NBC to cover the war in Iraq as a backpack journalist to be an entrepreneurial opportunity to prove a new model of content creation. It was one that was more nimble, responsive and cost-effective, thanks to emerging digital technologies and platforms. I completed my transformation two years later when we produced our first independent documentary film, Independent America: The Two-Lane Search for Mom & Pop. In doing so, we pioneered the use of subjective storytelling powered through a connection to highly motivated communities (as we shared our production nearly in real-time). In the process, my “career” became a series of meaningful experiences — which only began to make sense in hindsight as I reflected upon this transformation to shape the Seattle-based graduate program I was asked to lead in 2007. 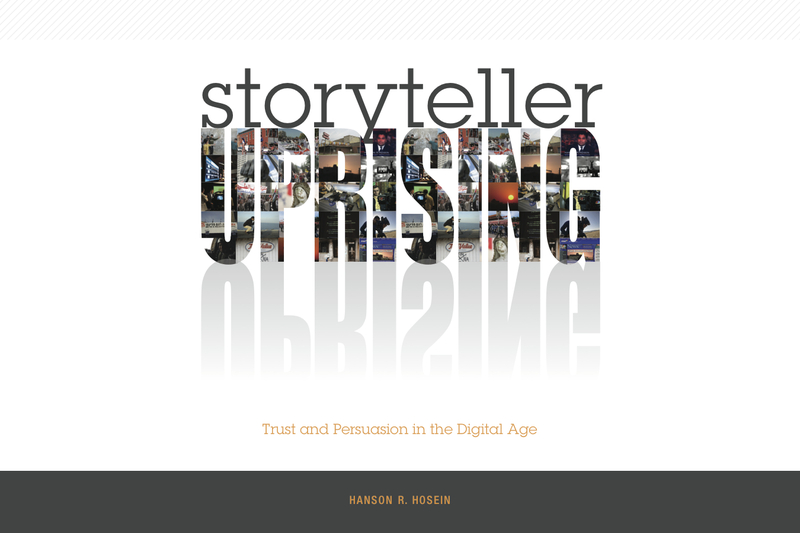 Although my book, Storyteller Uprising: Trust & Persuasion in the Digital Age, captures this learning as a manifesto for the Communication Leadership program, it has actually been through the countless times I have told my story face-to-face in classrooms, board rooms and town halls that have truly connected others to the premise of this “uprising” and to the Master of Communication in Digital Media/Master of Communication in Communities & Networks. I have given a “variation on a theme” of this keynote presentation since 2008, with the defining point always being my epiphany in creating Independent America, despite having produced other films since then, and leading the growth of the graduate program into a powerhouse for professional education. Here’s the most recent edition of the “Storyteller Uprising” slides that I’m using to keynote this fall at the Public Relations Society of America, PrimeGlobal, Weber Shandwick Asia, the Seattle Interactive Conference and “Telling the Story” for the European Commission in Brussels. However, with the recent opening of the Bezos Center for Innovation at Seattle’s Museum of History and Industry, I have a new inflection point. I led the production of video for this new permanent exhibit. I also “double interviewed” many of the featured innovators for those videos for our Four Peaks show. By doing so, not only did we create a strong case for branded content, I now recognize that I produced some of the best work of my professional life by synthesizing ideas and connecting people. This indeed may be my new role as I begin my “third act.” This time, I used Prezi to highlight this work in presentations at the Bezos Center opening, as well as to the Seattle Chamber of Commerce Regional Leadership Conference. Indeed, I presented some of the “how to innovate” best practices I learned from my interviews at the Seattle Chamber’s other main event this year, its 131st Annual Meeting, where I moderated a “Seattle 3.0” discussion. It was broadcast on the Seattle Channel (watch here). The video that framed the event (education, entertainment, sustainability, entrepreneurship) features some of my own perspective on innovation. It was produced by the Chamber’s Kim Lichttenegger, who’s also a student in our graduate program (we’re everywhere). Over the past decade, I have been in perpetual “sales” mode: as an independent filmmaker, the director of a self-sustaining graduate program, a consultant, a thought leader and as an entrepreneur. I increasingly wonder whether I’ll ever have the opportunity to just create again — as I did so long ago at NBC — and leave the selling to others. It’d be nice. But it’s unlikely. “Build it and they will come” is a myth. Ideate, innovate, connect, iterate, scale — repeat — is our new reality. Or at least, it’s certainly mine. Previous:Terms of Engagement: How we connected to Bezos, Schultz, Martinez et. al. Next:Behind the scenes with various world changing luminaries…and me!